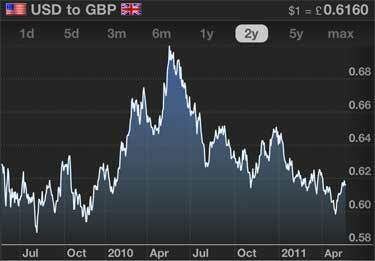 Are there any online poker sites out there that allow you to play poker in pounds (GBP)? Yes, yes there are. You can actually play no limit Hold'em, limit Hold'em, Omaha, cash games and tournaments in pounds at some sites. The best GBP poker sites. What do the "account" and "play" columns mean? Account. You can manage your account in GBP. So you can deposit, withdraw and manage your money in pounds sterling online. Play. You can also play online poker for real money using pounds and pennies instead of dollars and cents. Some sites are only able to allow you to manage your account in GBP, and do not offer GBP tables for you to play at. Some sites on the other hand allow you to do both. Therefore, for the full experience of GBP online poker, you want to play at a site that ticks both boxes. 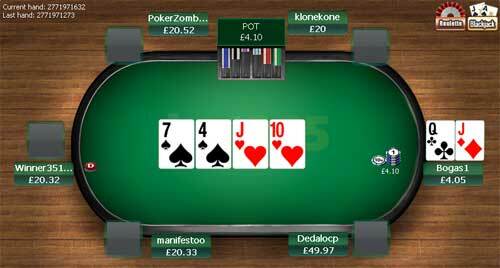 Screenshot of a GBP online poker table (£0.10/£0.20) in action. Look at that beautiful currency. Note: You can deposit at any online poker site from a UK bank account, even if the poker room only allows you to manage your online account in USD. So depositing money with pounds is not an issue at all. If you're not too bothered about the ability to manage your account in pounds or play in pounds, you could just go ahead and check out the full poker room listings page. Three reasons to play online poker in pounds. Assuming you're from the UK like me, or you just happen to love our currency, here are 3 of the best reasons to play at an online poker site with GBP tables. 1) It's a familiar currency. If you're playing in a cash game online for pennies and pounds, you'll always know the exact value of the money in front of you. The default currency at the majority of online poker rooms is dollars. Now, I don't know about you, but I don't remember the last time I bought a bag of fish and chips and paid in dollars. In fact, I'm not entirely sure how much it would cost in that currency. I just haven't been brought up using USD, so I'm not naturally familiar with it. So why play poker in dollars if you don't have to? With a UK poker room there's no more "so how much did I just win?" or "how much is my stack worth in pounds?". If you're playing in pounds sterling, you know when you've won a tenner, and you know that that's an extra 3 or 4 pints on the weekend. 2) No exchange rate conversions and fluctuations. If you're playing at a poker sites that allows you to deposit, withdraw and manage your account in GBP, you never have to worry about conversion rates and whether or not you're getting a bit of a raw deal. In fairness, whenever I've made a deposit at a USD poker room the conversion rate has been very honest. But still, conversion rates can change, and if the pound strengthens against the dollar between depositing and withdrawing you may lose out on a few quid. If you deposited £70 around May 2010, you would get roughly $100. If you then went to withdraw that $100 in April 2011, you would only get £60 back. It's not a massive deal, but it's just nice to not have to worry about small things like that. We are poker players after all, not day traders. 3) Because it's a glorious currency. Not a totally legitimate reason I know, but whatever. I actually look forward to spending tenners, fivers and other UK bank notes after coming back from holiday. I'm sure you've thought the same thing as well on the flight home from Tenerife. As you can see I'm a big fan of pounds and pennies, so if I can play online poker in GBP then that's just brilliant. If you've played cash games online much before you'll be familiar with the standard stakes/levels available, such as; $2NL, $5NL, $10NL, $25NL, $50NL, $100NL and so on. If you're a small stakes player, check out my list of the best poker rooms for low limit games. Is it worth signing up to a GBP poker room just to play in pounds? A year or two ago (I'm writing this in 2019) I would have said no. The GBP tables at online poker sites were more of a novelty than anything, with a limited number of players sitting at these tables throughout the day. Thankfully however, over recent years the GBP poker tables have rapidly increased in popularity. The USD has become less of the "standard" currency in online poker as more European players take to the tables. More and more poker sites are now offering GBP (and EUR) cash games and SNGs, so these currencies are no longer "novelties". So if you're currently playing in dollars because you thought there weren't enough pound poker tables around (even though you would have preferred to play in this currency), you now have a genuinely good reason to switch your bankroll over to a UK friendly poker site. Making a deposit at an online poker room in pounds. The absolute easiest way to deposit at an online poker room instantly from the UK is using your debit card or credit card. The minimum deposit is usually either a fiver or a tenner, which is perfectly standard. …and a few more that I'm sure I'm forgetting. You just type in your card details, say how much you'd like to deposit, click to confirm and you're done. Honestly, it's faster and easier than paying for your Friday big-shop at Tesco. I'd only really consider these as alternative options though if you've got a debit card handy. They all work perfectly well, but banking with your card is just a total breeze. A few facts and stuff about UK money. I've got a bit of time on my hands, so here are a few interesting facts I found out about on my travels. Basically, most of these denominations were around before decimalisation in 1971, which was the introduction of the new system for UK money. Prior to 1971, there were 240 pennies in a pound, as opposed to the 100p of today. I guess it's a bit like the currency's version of the way we've moved from imperial over to the metric system for weights and measurements (i.e. from lbs, ounces, inches and feet – to kilograms, grams, centimetres and metres). By the way, if you're really interested in this stuff for whatever reason, here's a nice list of old UK coins. The famous people on banknotes. £5 Elizabeth Fry 2002 Prison reformer. Helped make treatment of prisoners more humane. £10 Charles Darwin 2000 Naturalist. Came up with the theory of evolution. £20 Adam Smith 2007 Philosopher. Regarded as the father of capitalism (in economy). £50 John Houblon 1994 The first ever Governor of the Bank of England . No need to pretend like you haven't played that game before. Oh, and if you're feeling particularly adventurous, you can also find out which people were on the older versions of UK bank notes here.